Year in and year out, PBS proves that it is the last bastion of truly worthwhile programming left on television. In comparison to the programming put out by History, Discovery and even Science Channel, PBS’ programming stands solidly above those networks. The documentaries put out by PBS and Public Media Distribution this year are proof positive of that. They make up the majority of this critic’s list of 2017’s top new From the true history behind what was nearly one of America’s worst nuclear disasters in American Experience: Command and Control, to the hard-hitting (and fittingly titled) documentary The Talk: Race in America, which focuses on relations between law enforcement and minorities, to even the Mythbusters-esque NOVA: Secrets of the Shining Knight and beyond, PBS has put out another strong crop of new documentaries this year. Of course PBS is not the only company represented in this year list, despite its once again strong presence. Smithsonian Channel and even MLB Productions are also represented here, too. 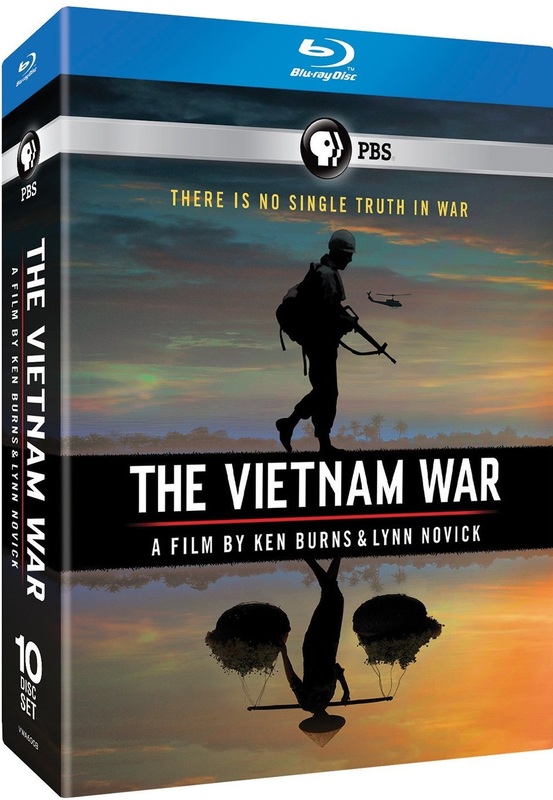 Leading off this year’s list of the top new documentaries is the The Vietnam War: A Film By Ken Burns and Lynn Novick. This mini-series documentary presents both familiar and not so familiar information about the war as well as footage that is impacting in its own right. Musical work by Nine Inch Nails front man Trent Reznor and his friend Atticus Ross add even more to the documentary series. Also included in the list, as noted already, is American Experience: Command and Control, which focuses on what was nearly one of America’s worst nuclear disasters. If that isn’t enough, there is also a history of the evolution of subway transportation in American Experience: The Race Underground. MLB Productions gets a nod with its new 2017 World Series Documentary, which tells the full, in-depth story of this year’s World Series. Smithsonian Channel’s nod comes in the form of the WWII documentary Hell Below, which focuses on the submarine conflict both in the Atlantic and Pacific theater. As with every previous list, this list features this critic’s Top 10 titles in their category alongside five additional titles for a total of 15 titles. Without any further ado, here for your consideration is Phil’s Picks 2015 top 10 New Documentaries. That’s it for this list. It’s not the end for the DVD and Blu-ray titles, though. There is still more on the way including the year’s top new Family DVDs and BDs, best new DVD and DVD re-issues, and hopefully a couple of box set lists. Stay tuned for all of that! The Houston Astros’ run to the 2017 World Series Championship is an historic part of Major League Baseball’s history. When the city that the team calls home was inundated by flood waters from Hurricane Harvey, the team became a beacon of hope for its residents. The team took that mantle and literally ran with it, giving its all from one game to the next, eventually finishing the regular season with 101 wins before advancing steadily but surely through the post season and on to the World Series Championship. Now thanks to Major League Baseball Productions and Shout! Factory, baseball fans nationwide can relive the Astros’ unlikely season, from the devastation of Harvey this summer to the final out of the World Series’ seventh game in the new 2017 World Series documentary. That story is told through the doc’s bonus material and its roughly 90-minute main feature, both of which are key elements of the doc’s presentation. The doc’s availability on DVD, Blu-ray and digital on one platform is also key in that it allows viewers to take in the story in all three platforms through just one setting. Each element is important in its own right to this forthcoming documentary, which is currently set to be released Tuesday, Dec. 5. 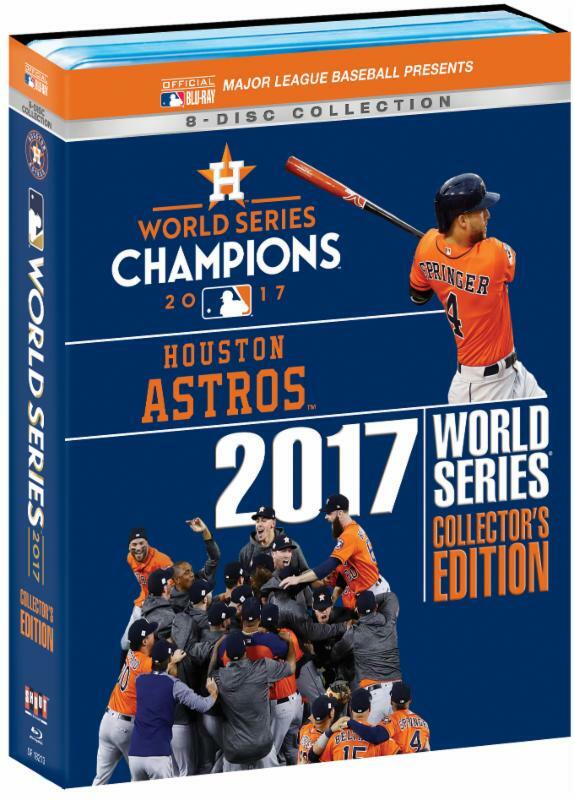 All things considered, they make this documentary a solid companion piece for the 2017 World Series Collector’s Edition: Houston Astros. 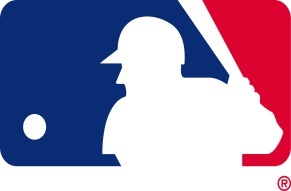 Major League Baseball Productions and Shout! Factory’s upcoming 2017 World Series documentary is a solid companion piece to the companies’ also soon-to-be-released 2017 World Series Collector’s Edition: Houston Astros. That is due in no small part to the story told through the pairing of the doc’s bonus material and its main feature. The main feature, which runs roughly 90 minutes, takes audiences through the entirety of the 2017 World Series, one game at a time, while also acknowledging the motivation that the Astros had to play so hard. It is told through the words of the men who took to the field on both sides of the ball game-by-game and through footage recorded during each game. That footage includes pre-game warmups by both teams. The frank words from the players does plenty to enhance the series’ importance because it lets audiences know firsthand what they must have been feeling in each game. The original broadcast audio from both teams’ radio networks adds even more emotion to the story. While there is some extraneous narration from Morgan Spector, his verbiage is kept to a minimum, making the experience all the more enjoyable. That minimization allows the teams and announcers to tell the story, again making for plenty of enjoyment. That enjoyment more than ensures viewers’ maintained engagement from beginning to end. Of course the story told through the doc’s main feature is only one way in which the story told here proves so solid. The story told through the bonus material also plays into that strength. The bonus material included in the 2017 World Series documentary includes two short yet impacting segments — “Houston Strong” and “How They Got There” — that tell the story of the Astros’ motivation to play hard for Houston and the impact of that drive. The prior tells the story in short but concise fashion, the story of Hurricane Harvey hitting Houston and of the Astros’ desire to be there for the city’s people. The latter tells the story of how the team’s efforts got it through its highs and even the lows of mid-season injuries, eventually giving way to the acquisition of Justin Verlander and the return to form for the Astros. The whole thing culminates with the Astros’ ALCS win over the Yankees. Given, it’s an extremely brief mention, but is there nonetheless. The bonus “Clenching Moments” and “Regular Season Highlights” reels add to the story told through the two main bonuses, making for even more engagement and entertainment for audiences. When all of this additional bonus material is set alongside the doc’s main feature, the end result is, for all intents and purposes, an in-depth story of how the Astros went from starting over from 2016’s struggles to taking on the mantle of Houston’s guiding light (so to speak) to Major League Baseball Champions. It is a story that every baseball fan will appreciate regardless of team loyalty, and is just one more reason that the doc in whole proves such a solid companion to the 2017 World Series Collector’s Edition: Houston Astros. The availability of the program on three separate platforms in one single setting puts the finishing touch on the program’s presentation. Major League Baseball Productions and Shout! Factory have made it possible for audiences to enjoy the 2017 World Series documentary on DVD, Blu-ray and digital platforms in one single combo pack. That’s nothing new for the companies’ World Series documentaries. What is really great for audiences is that they have made it possible for audiences to enjoy the program on all three platforms in one single setting, rather than forcing them to choose between platforms. The average price point of $22.78 ($23 and change with tax) gives audiences all three platforms in one, allowing them to enjoy the program at home and on the go. For those wanting just one platform, the program is also being made available on standalone DVD at an aver age price point of $20.22. That’s not a bad price point, and is cheaper on the surface than the price point for the 3-platform combo pack. However in a 24/7 digital world, the slightly more expensive combo pack that includes a digital download code makes more sense. Not only that but it also allows audiences to watch the program on any platform or even lend one of the discs to family and/or friends without worry. Keeping that in mind, the availability of this documentary on both multi-platform setting and a single platform setting shows how much thought was put even into this aspect of its presentation. MLB Productions and Shout! Factory are to be commended just as much for this as for the product presented through the program’s central and bonus content. When all of this is considered along with the story told through the noted content, the result is a presentation that is just as enjoyable to take in as the actual World Series and that expertly completes the presentation of this year’s Fall Classic. The boys of summer are officially done for another year, but as teams take their annual break from the fields, fans nationwide will soon have a new way to pass the time as they count the days to the start of the 2018 season. That is because Shout! 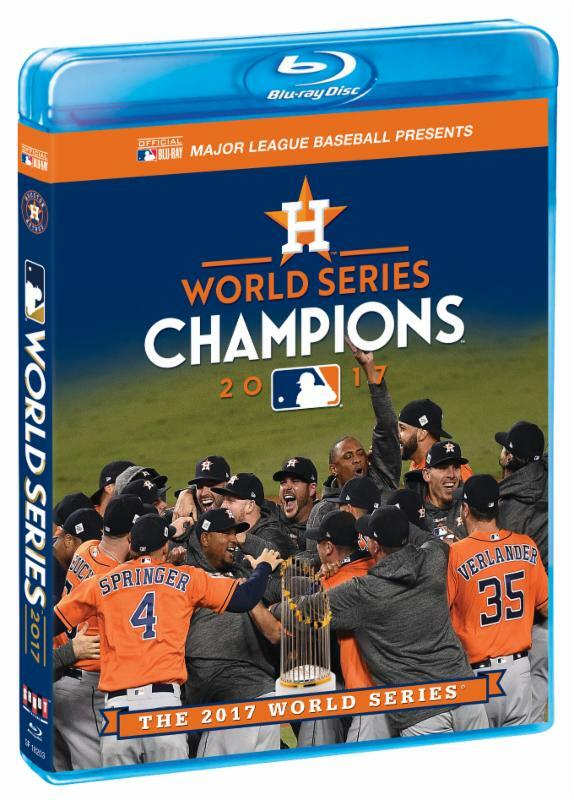 Factory and Major League Baseball have partnered to release this season’s seven-game World Series in whole on DVD and Blu-ray in the form of the 2017 World Series Collector’s Edition: Houston Astros. This collection is everything that baseball fans have come to expect from the sport’s annual World Series collections beginning with the series’ very presentation. This will be discussed shortly. The set’s companion booklet adds to that presentation, and will be discussed later. The set’s bonus American League Championship Series Game 7 is a welcome bonus that rounds out the set’s most important elements. Each element is key in its own way in this collection’s presentation. All things considered, they make this latest World Series Collection another set that baseball fans nationwide will appreciate regardless of team loyalty. Major League Baseball and Shout! Factory’s forthcoming 2017 World Series Collector’s Edition: Houston Astros is a collection that baseball fans nationwide will appreciate regardless of team loyalty. That is due in no small part to the set’s very presentation. Presented in this set is the complete 2017 World Series. All seven games are shown from the top of each inning to the bottom just as they aired on FOX stations nationwide. As an added bonus, audiences can choose how they experience the game’s call not just one way, not two ways, but four ways — the Dodgers’ radio network, Astros’ radio network, Spanish-Language radio broadcast and Fox television broadcast. In giving audiences so many listening options once again, Shout! Factory and Major League Baseball Productions have once more shown great respect for baseball fans everywhere. The edits between innings are clean, making the experience all the more engaging and entertaining. That is because keeping the commercial breaks in the production maintains the feeling of having seen the series live without the wait times from the initial airings. As if all of that is not enough for audiences, each disc once again presents the final score for said game on its art, setting the stage before each game even starts. Shout! Factory and MLB Productions are to be highly commended for paying such close attention to every detail yet again. It shows that MLB Productions has lived up to its reputation once more in this box set. Keeping that in mind, it’s just one way in which MLB Productions has impressed yet again with this set. The companion booklet included in the set adds just as much enjoyment to the set’s presentation. The companion booklet that is included in the 2017 World Series Collector’s Edition: Houston Astros gives audiences just as much to appreciate as the presentation of the games themselves. As with every one of the Fall Classic’s past home releases, the 2017 World Series Collector’s Edition: Houston Astros‘ companion booklet takes audiences game-by-game through the series. Stats for each team are presented again for each game alongside inning-by-inning scores, trivia about the teams’ (and series’) history, gametime weather, game lengths in terms of time (and innings) and so much more. Some of the key trivia included in the rundown for Game 1 included the revelation that this year’s series marked the first time since the 1970 World Series between the Reds and Orioles that two 100-game-plus teams faced off for MLB’s top title. In the Game 5 info, audiences learn that “the eight go-ahead homers and six game-tying blasts hit in Games 1 through 5 are both records for a Fall Classic of any length.” Between the in-depth, game-specific stats, trivia and other info included in the series’ companion booklet, audiences get a full standalone experience in itself from the booklet. When the games are on, audiences can use the booklet as a program of sorts, following every pitch, hit and out as it happens, making the experience just as good as being at the games, if not better. This dual purpose use makes clear why this set’s booklet is so important to its overall presentation. It is not the last of the set’s most critical elements, either. The set’s bonus American League Championship Series Game 7 presentation rounds out the set’s most important elements. Just as with each of the World Series’ games, Shout! Factory and MLB Productions present the seventh game of the ALCS in its entirety. The companies did not ignore that game either in the set’s companion booklet. It is outlined in full in its own page in the booklet. Given, the trivia included in the World Series games is not there. The full details on the game are there, though, allowing audiences to follow that game just as easily as the World Series games. Also as with the World Series games, the ALCS Game 7 disc also features its final score on its art, once more setting the stage for the game. Houston won that game 4 – 0 against the Yankees, who at the time of this posting are interviewing Carlos Beltran (a former Yankees player) for its managerial job. When all the positives of this bonus game are set alongside the positives of the set’s 2017 World Series presentation, the whole of the two presentations — and the set’s companion booklet — make this collection overall yet another home run for Shout! Factory, MLB productions and baseball fans alike. It’s time to fly the “W” again. Shout! Factory is going to bat with Chicago Cubs fans one more time next month when it releases the historic seventh game of the 2016 World Series in its own standalone Blu-ray and DVD release. The iconic game marked the end of a 108 year wait for the club, its fans and the city that supported it through thick and thin. 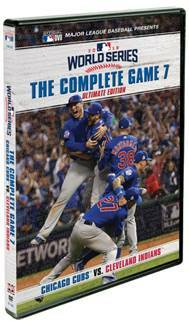 2016 World Series: The Complete Game 7 Ultimate Edition will be released in stores and online on separate two-disc DVD and Blu-ray sets on Tuesday, May 9. Retailing for MSRP of $24.97 (Blu-ray) and $19.97 (DVD), viewers can pre-order it online now via Shout! Factory’s online store at a discounted price of $19.97 (Blu-ray) and $16.97 (DVD). This latest presentation of the 2016 World Series’ seventh game presents the landmark four hour, twenty-eight minute matchup in its entirety complete with four separate audio options. Those options are the original TV broadcast audio, Chicago Cubs radio broadcast, Cleveland Indians radio broadcast and Spanish-language broadcast. 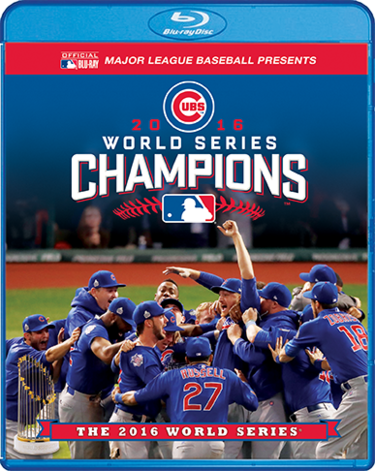 As an additional bonus, the two-disc set also includes highlights of the Cubs’ 2016 postseason wins on the way to the World Series and the parade that followed. The 2016 World Series is one of the most important fall classic series that Major League Baseball and its fans have seen in over a century. It was through this year’s World Series that “next year” became “this year” and “it can happen” became “it did happen.” Next Tuesday, Cubs loyalists and baseball fans alike will be able to own the complete 2016 World Series for themselves thanks to MLB Productions and Shout! Factory in the form of the 2016 World Series Collector’s Edition: Chicago Cubs. This piece is a must have both for Cubs loyalists and for MLB fans in general. That is due in no small part to the 8-disc set’s overall audio and video presentation. That will be discussed shortly. The companion booklet included in the set is just as important to note in examining the set’s presentation as its overall presentation. Last but hardly least of note here is the set’s bonus disc. Each element is key in its own right to the box set’s presentation. All things considered, this box is the year’s top new sports box set, the year’s top new family box set, and one of the year’s top new overall DVD/BD box sets. Shout! Factory and MLB Productions’ 2016 World Series Collector’s Edition: Chicago Cubs takes three swings and hits it out of the park all three times. This set is the year’s top new sports box set, the year’s top new family box set and one of the year’s top new DVD/BD box sets. That is due in no small part to the overall presentation of the 7-game series in the set’s main feature. Presented in the set’s main feature is the 2016 World Series in its entirety from the first pitch to the last out. All seven games are here just as they were originally presented on FOX. The commercial breaks are even included in each game, just without any commercials. So that speeds things up at least a little bit, making the overall viewing experience even better. If that isn’t enough for fans, MLB Productions and Shout! Factory have offered fans the option to experience the game with standalone radio broadcasts from the teams’ home radio stations in place of the TV call and even in Spanish. On the surface that might not seem like much, but in the bigger picture of the series’ presentation here, it is very important to note. Some people prefer radio broadcasts to the TV call whether in English or another language. Others prefer the TV call to radio. So what MLB Productions and Shout! Factory have done here is honor all of the game’s fans. They are to be highly commended for paying such attention to even this detail. Of course, those familiar with MLB Productions’ past World Series know this is nothing new for those productions. That makes MLB Productions even more deserving of applause here. It shows that MLB Productions has lived up to its reputation once more in this box set. Keeping that in mind, it’s just one way in which MLB Productions has impressed yet again with this set. The companion booklet included in the set adds just as much enjoyment to the set’s presentation. 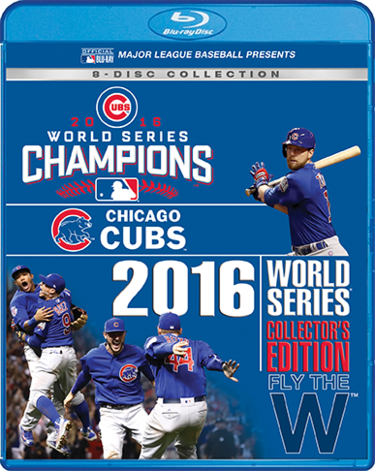 The full, diverse TV and radio presentation of the 2016 World Series in the 2016 World Series Collector’s Edition: Chicago Cubs is in itself a hugely important piece of the set’s presentation. It allows audiences to re-live the 7-game series in its entirety not just on TV but on radio while still getting to see it on TV. What’s more, Shout! Factory and MLB Productions have allowed fans here to experience it simultaneously on radio and TV both in English and Spanish. This is a huge statement of the dedication to the game’s fans across the board. In and of itself, it makes this element a hugely important piece of the set’s presentation. It is only one important piece of the set’s presentation, too. The companion booklet that is included with the set lives up to MLB Productions’ reputation just as much as the presentation of the game on disc. Once again, MLB Productions has included a complete box score for each game. That means it presents the numbers not just for the Cubs but for the Indians, too in each game. Audiences even get some interesting trivia with each game to enhance the viewing experience. Just one of the interesting pieces of that trivia that is included in the set’s companion booklet comes in the outline of Game 7. The booklet notes with this game;s information, :The Cubs are the first team to come back from a 3 – 1 deficit and win World Series Games 6 and 7 on the road since the 1979 Pirates.” Audiences also learn of the Indians in the notes for Game 3, “The Indians’ Game 3 shutout was their fifth in the 2016 postseason, establishing a Major League record for a single postseason.” As an added note, fans also learn here that the Indians’ game three World Series win meant the team won all eight postseason games when it scored first. These are just some of the interesting tidbits that are shared through the series’ companion booklet. There is far more that audiences will enjoy when they purchase the set for themselves or that special MLB fan. Each game even includes a note of the temperature at the start of each game, the games’ attendance and much more. The booklet gets that specific with each game’s outline and then some. When this is all taken into consideration, it becomes even more clear why the collection’s companion booklet is just as important to its presentation as its overall presentation. It is just one more piece of the set’s presentation that stands out. The inclusion of the Cubs’ NLCS Game 6 win over the Dodgers rounds out the set’s most important elements. The overall TV and radio presentation of the 2016 World Series in the 2016 World Series Collector’s Edition: Chicago Cubs and the set’s companion booklet are both key components of the set’s presentation. The overall TV and radio presentation of the series and its presentation of the series in its entirety gives audiences a full viewing experience in the utmost sense of the term. The set’s companion booklet adds even more depth and enjoyment to the set’s presentation with its bonus trivia and fully in-depth box scores. Both elements are key by themselves and together. However, they aren’t the set’s only important elements to note. The bonus NLCS Game 6 presentation included in the set rounds out the set’s most important elements. MLB Productions and Shout! Factory have included in this set, the Cubs’ 5 – 0 shutout of the Dodgers in Game 6 of the 2016 NLCS as a bonus for audiences here. For those who might not know, the NLCS was just as interesting as the World Series. The Cubs opened the series with a solid 8 – 4 win over Los Angeles, But then, Chicago fell behind 2 games to 1 in games 2 and 3, only to come back and win the next 3 games and take the series. Thanks, again, to MLB Productions and Shout! Factory, audiences get to see the Cubs’ dominating NLCS Game 6 in its entirety. It was that game that catapulted the Cubs into the World Series. So audiences get to see that pivotal game and the World Series in whole, and even follow along at their own pace through the set’s companion booklet while learning some interesting facts along the way, too. Clearly, all three elements play their own huge part in the set’s presentation. All things considered, they show that MLB Productions has lived up to its reputation once again as has Shout! Factory, the leading name in home entertainment (at least in this critic’s view). They make this set in itself yet another home run for Cubs fans and MLB fans alike. When all of this is combined with the equally impressive 2016 World Series Film, which was released Dec. 6, the whole of both sets is a grand slam for any MLB fan and any Cubs fan. History was made this year in Major League Baseball. That is because next year finally became this year for the Chicago Cubs. After 108 years, America’s favorite lovable losers finally ended the curse of the billy goat and won baseball’s most coveted prize. Baseball fans can relive that history making moment for themselves and more thanks to MLB Productions and Shout! Factory beginning December 6th with The 2016 World Series. 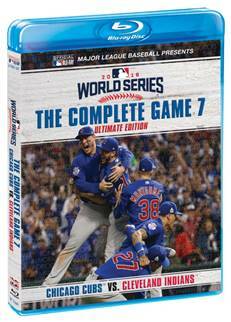 This double-disc set looks back on the 2016 World Series between the Cleveland Indians and Chicago Cubs. The program’s central story is its key element. It will be discussed shortly. The program’s bonus material is just as important to its presentation as its central story. It will be discussed later. The platforms on which the film will be made available round out is most important elements. One could also note the program’s editing is worth noting in examining its presentation, too. All things considered, Shout! Factory and MLB Productions’ presentation of The 2016 World Series is another home run for any baseball fan regardless of team loyalty courtesy of MLB Productions and Shout! Factory. The 2016 World Series official film from MLB Productions and Shout! Factory is a home run for any baseball fan regardless of fans’ team allegiance. That is due in part to the program’s central story. The story, narrated by actor Vince Vaughn (Wedding Crashers, The Break-Up, Fred Claus), follows the Cubs’ road to the Major League Baseball Championship. It includes interviews with members of both teams’ lineups. They add even more emotion to the store and in turn make the story even more gripping. From the high of winning the second game to the come from behind climb that the Cubs had to make to eventually win Game 7, baseball fans will be left on the edge of their collective seats even if they got to see each game live on TV or in person. The teams’ interviews, Vaughn’s narration, and the use of the game footage join together to keep viewers completely enthralled throughout the course of the story’s 90-minute run time. The editing used in the footage makes the story even more powerful. It will be discussed later. Getting back on topic, the story, with all of its combined elements, proves to be one of the most important of this program’s elements if not its most important element. It’s just one of the program’s important elements, too. The program’s bonus material is just as important to note in examining its overall presentation as its central story. The story at the center of The 2016 World Series official film is an important part of the program’s presentation. It could be argued, in fact, to be the program’s most important element. It is just one of the program’s key elements, too. The program’s bonus material is just as important to its presentation as its story. It is important first and foremost because it covers not just highlights from all seven games of the 2016 World Series, but also from the Cubs’ historic season and even the parade in which the team was welcomed home as heroes. Audiences get to see in the regular season highlights, key moments from the Cubs’ games against the Phillies, Reds, and others as they made their way to the top of the league. The clinching moments include highlights from even more games. Much like the regular season highlights, they show the team’s power and what made the Cubs this year’s team of destiny. The World Series highlights put the finishing touch on the central story, reminding audiences once more what made this year’s World Series one of the game’s best in ages. The parade highlights put the finishing touch on the bonus material, rounding out their mini-story and is just as certain to leave baseball fans (and especially Cubs fans) shedding tears of joy without the slightest regret. Of course the story that is told through the bonus material is itself just one reason that the bonus material stands out. Audiences will note in watching the bonus material that it is presented chronologically. It takes viewers through the regular season, into the post season and to the end of the road this year. This is hardly the first time that MLB Productions has done this, and MLB Productions is to be applauded for once again taking such an approach. When all of this is set alongside the program’s central story, the two elements make even clearer why The 2016 World Series official World Series film is so enjoyable presentation. They are not its only important elements, either. The program’s triple-platform presentation rounds out its most important elements. The story at the center of The 2016 World Series official film and its companion bonus material are both key to the program’s overall presentation. Both by themselves and together, they tell a story that will keep baseball fans across the broad completely enthralled. This applies even for fans who watched every game live on TV or in person. They are not its only key elements, though. The platforms on which the film will be made available round out its most important elements. Audiences will be happy to know The 2016 World Series will be offered on a single disc DVD/Digital package and deluxe DVD/BD/Digital combo pack. The DVD/digital combo pack features the film, obviously, on DVD and includes a digital download code while the deluxe edition features the film on a double-disc presentation that also includes a digital download code. One of the discs is a DVD presentation of the film and the other a Blu-ray presentation. The DVD/digital combo pack’s average price is $20.22. That is important to note because that average price is right along the lines of Shout! Factory’s own price point of $20.99. So while Shout! Factory’s price for the DVD/digital combo pack might not be the cheapest price on the surface, it is actually very affordable considering the combo pack’s average price. The average price for the DVD/BD/Digital combo pack is $27.61. Its list price is $34.99. Considering this and Shout! Factory’s price of $27.99, audiences will pay about the same regardless of which outlet they choose. That makes Shout! Factory’s store a great place from which to order both the BD/DVD/digital combo set just as much as the DVD/digital combo pack. When this is set alongside the film’s central story and its bonus material, all three elements show clearly why The 2016 World Series official film is a home run for any baseball fan. It boasts a gripping story, enjoyable bonus material and a relatively affordable price point across the board. That’s not even touching on the program’s editing, which adds even more depth and enjoyment to the program. All things considered The 2016 World Series proves to be one of 2016’s top new sports documentaries and a piece that every baseball fan should have in his or her own home DVD/BD library.